1. Progression of the disease from childhood. This usually occurs when scoliosis is not treated early or went unnoticed during childhood. The scoliotic curves may be thoracic, lumbar, or both. 2. The asymmetric degeneration of spinal elements. This may be caused by osteoporosis (porous bone), disc degeneration, compression fracture, or a combination. These conditions usually affect the lumbar spine and can affect vertebral height, shape, or basic structural integrity. 3. Combination of numbers 1 and 2. 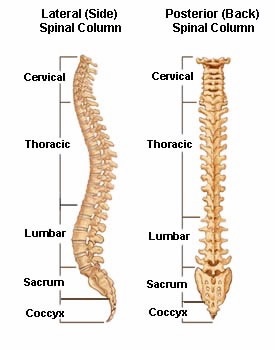 The spine's normal curves occur at the cervical, thoracic, and lumbar regions. These natural curves position the head over the pelvis and work as shock absorbers to distribute mechanical stress during movement. The normal spine viewed posteriorly (from behind) appears straight from neck to buttocks. However, a scoliotic spine bends to the left or right resembling the letter S or C.
Scoliosis is a complex three-dimensional disease. To understand this concept consider that in some cases, as the spine curves abnormally, the involved vertebrae are forced to rotate. If rotation occurs at the thoracic level of the spine, vertebral turning impacts the rib cage and may result in rib prominence on the opposite side of the curve. In severe cases, lung and heart function can be compromised. Back pain is the primary complaint. Pain is more common and severe in the lumbar spine. When the pain is thoracic, rest often alleviates it. This may be confused with arthritis pain. Although scoliosis is known to cause deformity (e.g. humpback), seldom is this the catalyst that brings the patient to a physician. Scoliosis may cause the patient's ears, shoulders, rib cage, and pelvis to lack symmetry. An asymmetric pelvis can lead to trunk imbalance and may make the patient appear as though listing to one side. Scoliosis can cause rib prominence on one side and leg length discrepancy, which often results in gait dysfunction. Pain, difficulty sitting or standing, stiffness, and spinal rigidity are often associated with scoliosis. Rarely does adult scoliosis adversely affect cardiopulmonary (heart and lung) function or cause neurologic complaints. However, a complete medical and orthopaedic evaluation by a physician with experienced in adult scoliosis is essential. •You're 20% more likely to develop scoliosis if someone else in your family also has scoliosis. •In 80% of scoliosis cases, the cause is unknown-that's known as idiopathic scoliosis. •Girls are at least four times as likely to develop scoliosis as boys…and doctors don't know why that is. •96% of adolescents with scoliosis continue to play sports. •Idiopathic Scoliosis: Idiopathic is a medical term meaning "occurring without known cause." In other words, doctors don't know why you developed scoliosis. Idiopathic scoliosis is broken down into four categories: o Infantile idiopathic scoliosis is the term used for children under 3. Juvenile idiopathic scoliosis refers to children ages 3 to 9. Adolescent idiopathic scoliosis is for children ages 10 to 18. Adult idiopathic scoliosis is the term for people who've reached skeletal maturity (i.e., their bones are fully grown). Over 80% of scoliosis cases are idiopathic, and of those cases, 80% are adolescent idiopathic scoliosis. Idiopathic scoliosis is most common in girls. •Congenital Scoliosis: Congenital means "present at birth." Congenital scoliosis is the result of malformation of part of the spine, and this malformation happens sometime in the third to sixth week of a pregnancy—that's when the spine starts to develop. Congenital scoliosis is usually the result of one side of a vertebra not forming fully. Doctors call this growth imbalance a hemivertebra, and it causes the spine to grow crooked. Congenital scoliosis can also occur when vertebrae don't segment like they should; they're naturally fused together in what's called a block vertebra. That also affects how the spine grows. •Neuromuscular Scoliosis: Children who have a neurological system disorder-such as cerebral palsy, spina bifida, or muscular dystrophy-can develop neuromuscular scoliosis. In this type of scoliosis, the spine usually takes on a long, c-shaped curve because the children have very weak trunks and aren't able to support their bodies. •Adult or Degenerative Scoliosis: This type of scoliosis becomes apparent in later life. It usually occurs when the disease went unnoticed or was not treated during childhood. Osteoporosis, disc degeneration, a spinal compression fracture, or a combination of these problems can contribute to the development of adult scoliosis. Increasingly, scientists are finding evidence for some scoliosis running in families (genetic). So if someone else in your family has or has had scoliosis, you have a greater risk for developing it. These symptoms all apply to adult scoliosis, as well.